Hello again and welcome back to the continuing saga of the Hobbit Hollow Construction Blog! Hmmmm. Interesting title yes? So let’s get right to it because time is of the essence. A couple of minor notes before we begin. The Mets clinched the National League East title in baseball Saturday night so that was terrific. The Jets however lost to the Eagles, which was disappointing to say the least. The Jets had their chances too but they played poorly in the first half. I keep forgetting there are a lot of people outside the United States reading the blog so I’ll keep my ranting to a minimum. I guess if I was talking about Manchester United that might be a different story. But I digress. Needless to say the New York Mets are heading to the playoffs! I can’t wait. Gonna have to prep myself for those late nights. So yeah the Pope stopped by Friday night. Okay not at the Hobbit House but he passed by the job I’m working on at 220 Central Park South! It was actually pretty exciting. We were working late when all of a sudden we noticed a large crowd gathering in the park. So every once in a while the crowd would roar and you would think the Pope was on his way. Alas a false alarm. But then the crowd went off. I mean went really off. It was like a football game when there’s a touchdown. It was really pretty incredible how loud it was. We were up on the 6th floor of this building and the sound was tremendous.Here’s the photo I got of the Pope in his Pope Mobile. What a special man. 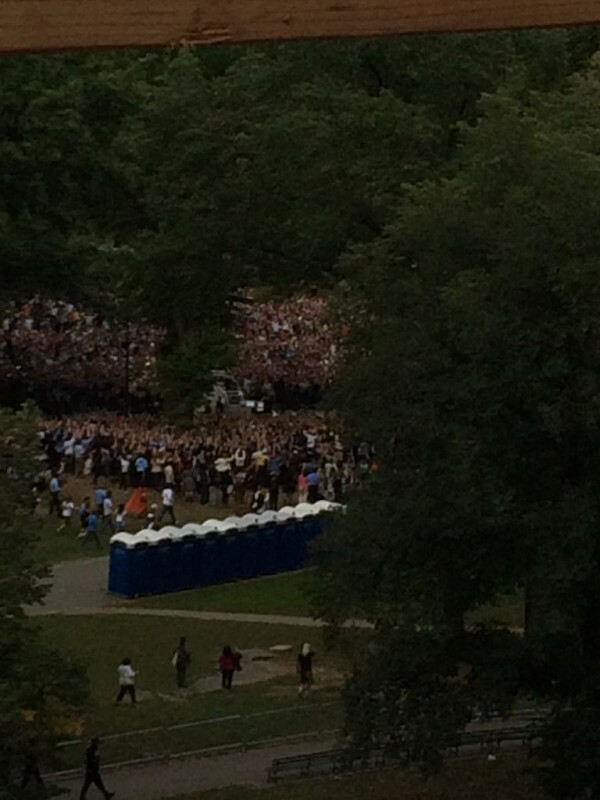 The Pope going through Central Park! 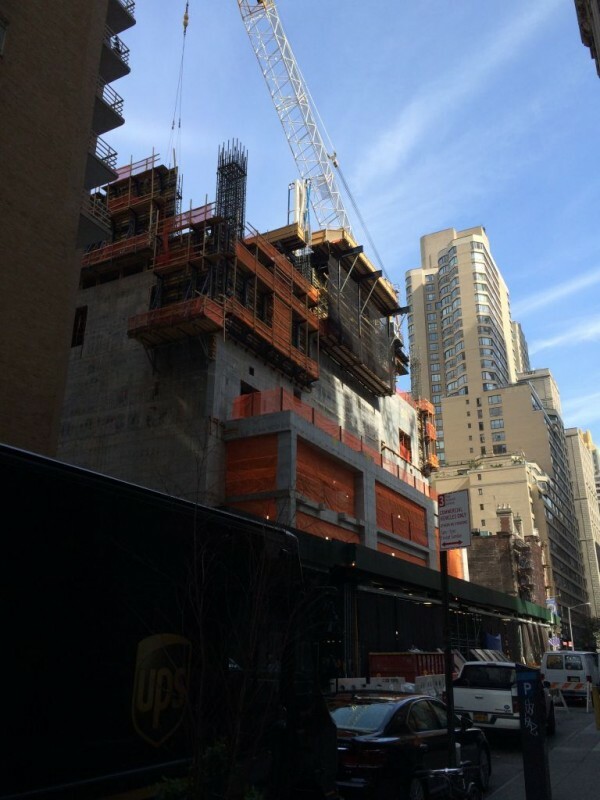 Here’s a shot of the job from 58th street. So okay it’s a construction blog so we have to talk about construction. That’s the gist of things. 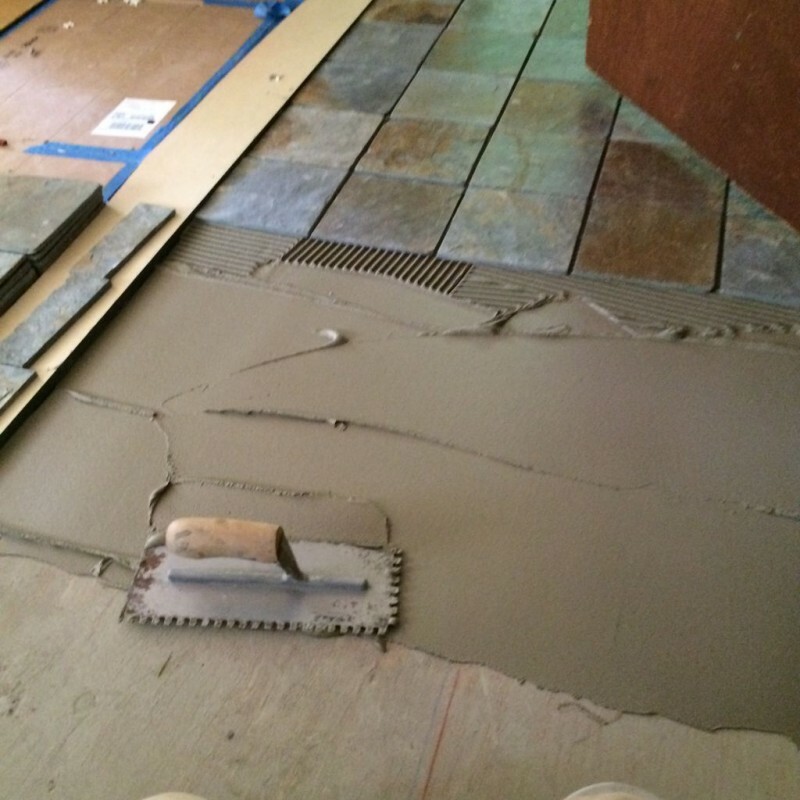 Well we had to take a bit of a time out this week so we could layout our tile floor in the hallway on the home front. 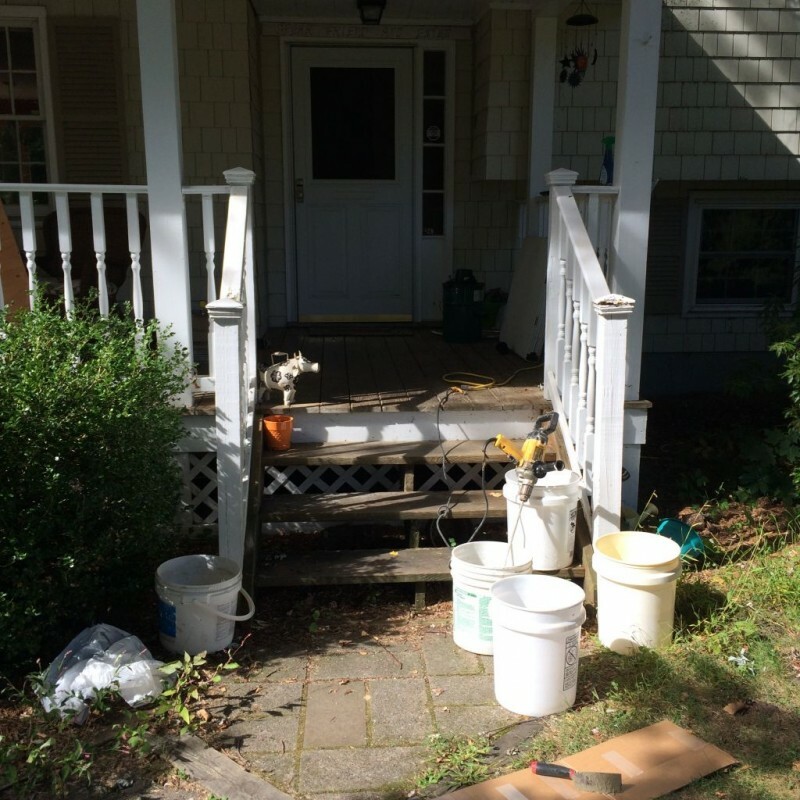 So laying tile is a multistep process and we’ll go through a few of the steps here today. First step is picking a tile and a grout you like. That may sound a bit silly but it can be a hassle and time consuming if you have a lot of choices. Like I said last week, the Editor and I happened upon a really nice slate that is unusual but very nice to look at. The problem with these tiles is that they are not cut to an exact size. They range in size from about 7 and 11/16ths light to 7 and 13/16ths heavy. So the layout of the tile is critical. What I like to do with tile that is either uneven or a bit random is lay out the whole thing and make sure it fits the way I want it to fit. I’m not a tile guy per se but I have done quite a bit of tile work in my day so this is how I do it. It may not be the fastest or best way but it gets the job done. So the first order of business was to set up a straightedge to work off of and begin laying out the tile. 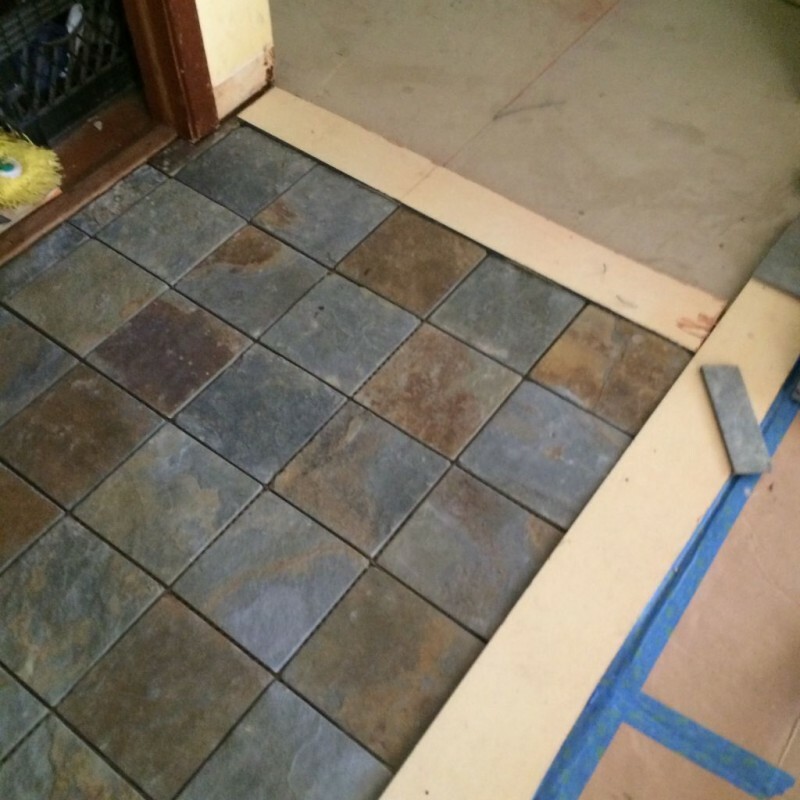 We started out using spacers but that was a waste because the tile size varied so greatly. 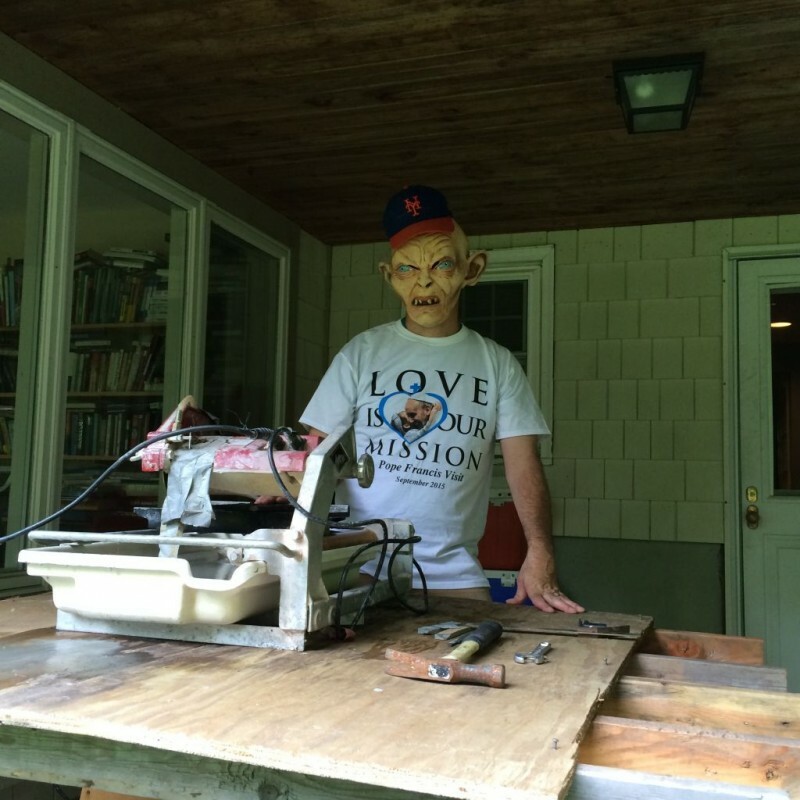 The Editor got into it and helped out quite a bit after dinner one night during the week. Here she is having at it. 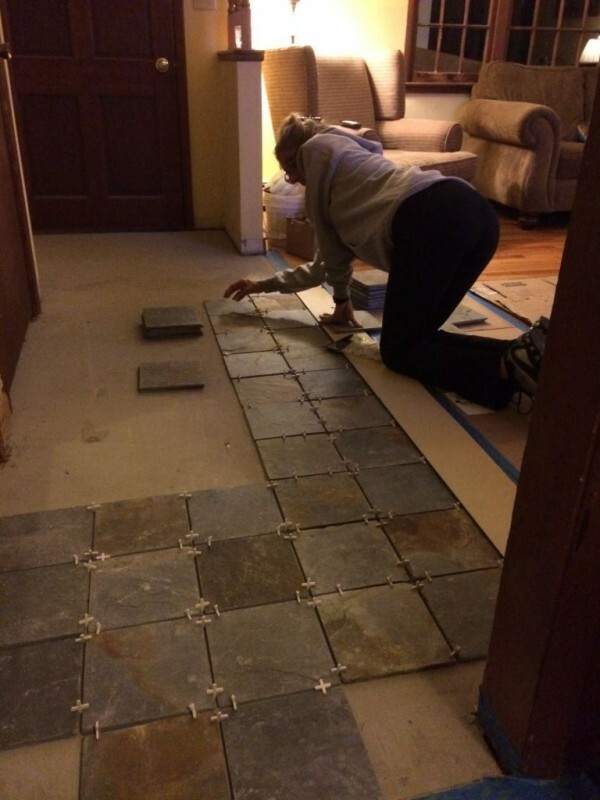 Editor laying out the tile for me. Like I said we got rid of the spacers after the second pass. It just wasn’t working. Anyhoo, once the full size tiles are in position you have to go back and do the cuts. The cuts can be a pain in the neck. Especially if you’ve got a lot of them. 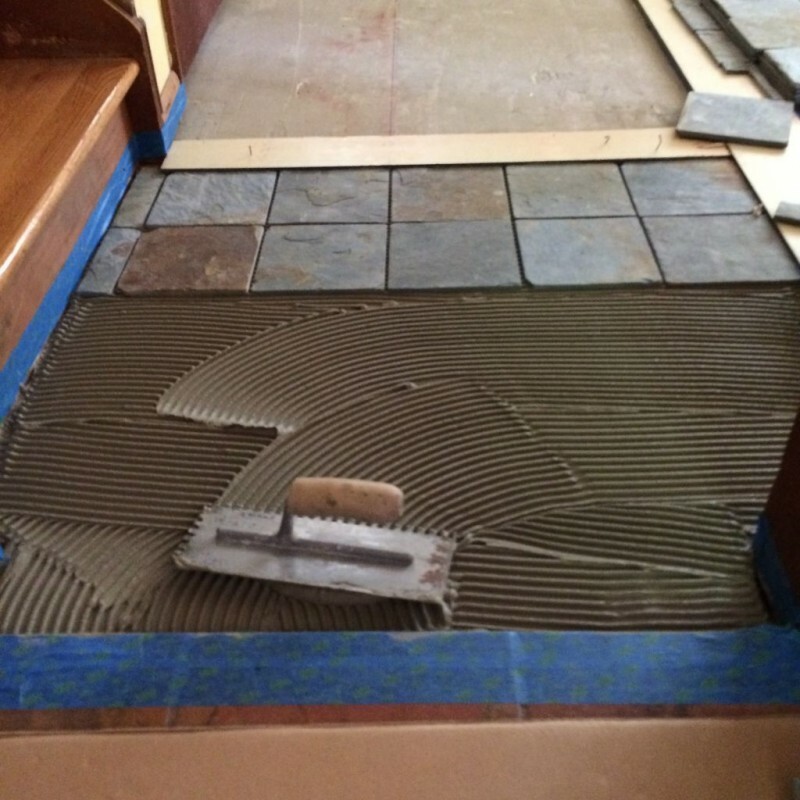 The plan was to do the cuts Saturday and lay the tile Sunday. Plans never seem to work out the way you imagine them to though. Worked late Friday, woke up Saturday exhausted. But the Lord works in mysterious ways does he not? Maybe it was the Pope’s visit but I get a phone call Saturday morning from Steve. He’s been reading the blog and is not real happy with the progress so he was wondering if he could come over and help out. So I told him my situation with the tile and Terence’s football game Saturday and he said he’s a pretty good cut man so I pressed him into service. So the key with cutting tile is having a good set up. 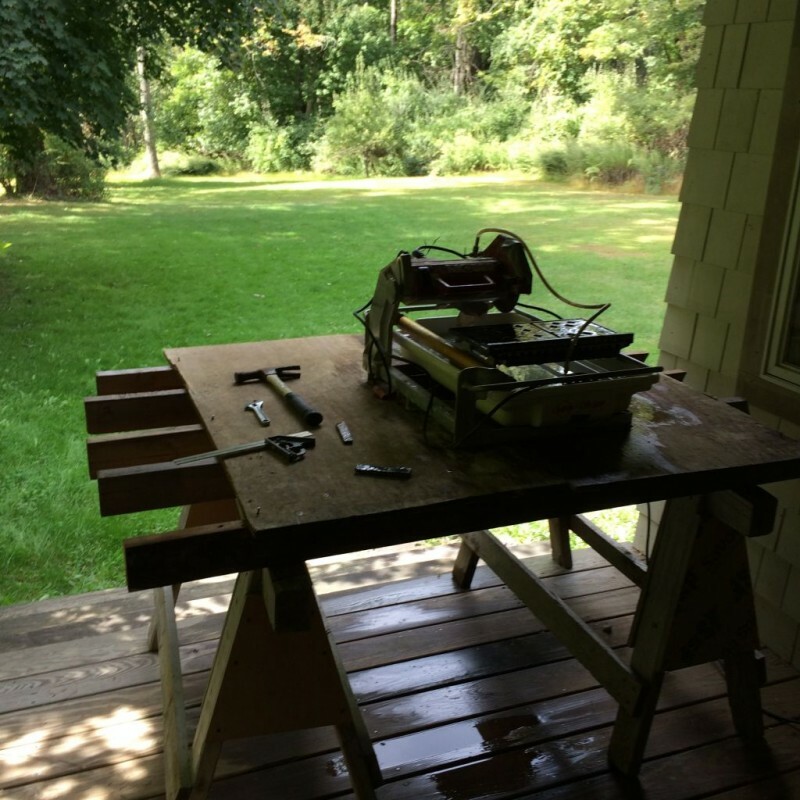 So I made a little bench for my wet saw so we wouldn’t have to bend over too much. Just something quick out of scrap 2×4’s and some old plywood. Check it out. So Steve gets there and he thinks this is an awesome set up. It really was if I do say so myself. It was great. I marked the tile, brought it downstairs, passed it along to Steve and he handed me the one he previously cut. We were like a machine churning out these cuts. Okay, I mean Steve isn’t the most pleasant thing to look at but nobody else was interested in helping. Beggars can’t be choosers. Here he is having at it with the wet saw. It turns out not only is Steve a Met fan, he also went to see the Pope! Check out that tee shirt. So after that it’s just a matter of pulling up the tile, mixing the thin set, and putting it back down. More or less. You don’t do it all at once. I think I did 5 mixes all together. 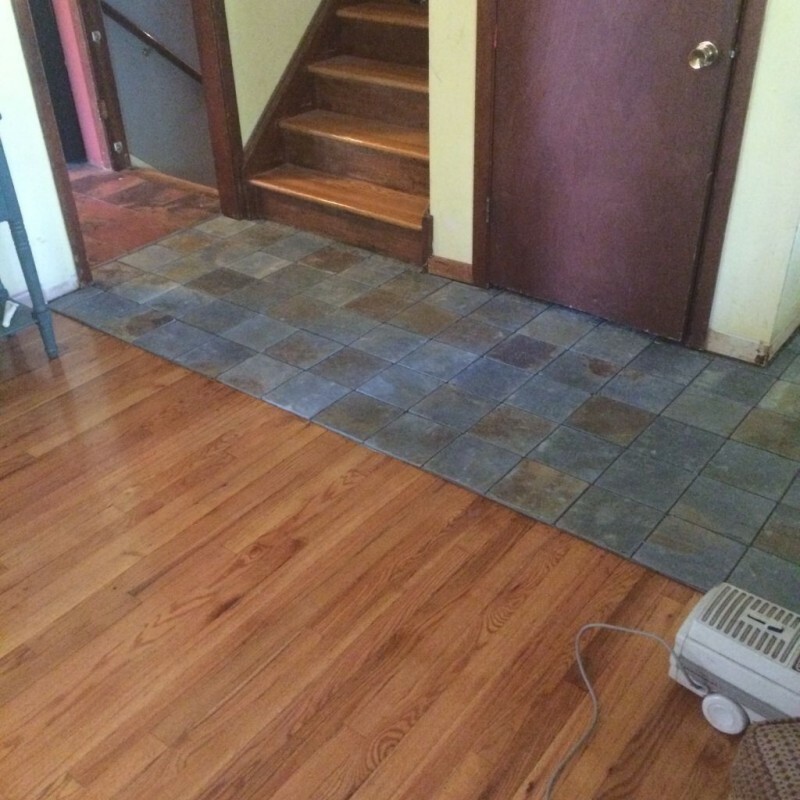 After you set a small area you step back and make sure you have the tile the way you want it. Then you check the lines and make sure the spacing is the way you want it. Here are a few pictures. Make sure your first pass you push the thinset into the flooring. Once you press the thinset into the floor then you comb it through with the notched trowel. Just making sure the tiles are square here before continuing. Alignment is key. Kind of goes nice with everything wouldn’t you say? Even the Electrolux. Have to wait at least 48 hours before grouting. Hmmmm. Not sure when that’s going to happen. On another note the Editor volunteered to cut the back lawn. That was a huge help. Ever see anyone cut a lawn in figure eight style? Well I just did. Amazing, but who’s complaining.